MakeupMadness107ByElina: Save your money. Inglot eyeshadows. Save your money. 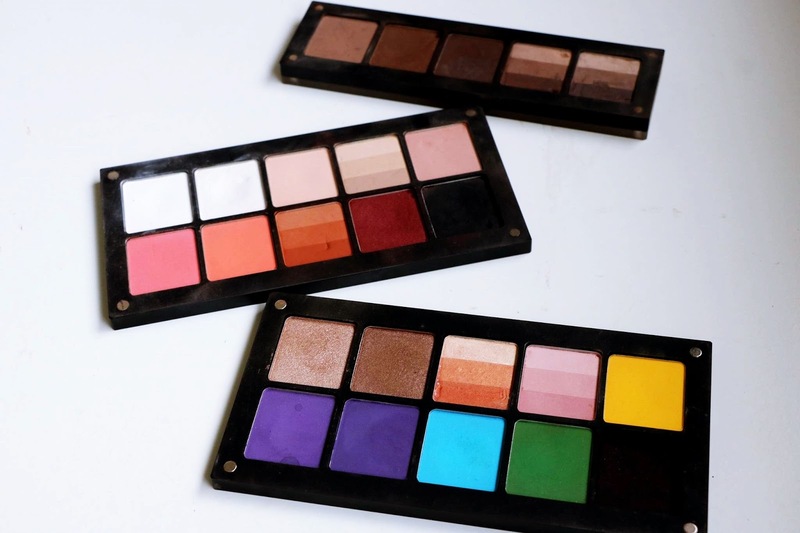 Inglot eyeshadows. This will be from my personal experience. When I started to study Makeup artistry I did not own even 1 eye shadow because I didn't know how to use them at all, so when I started college I obviously needed to buy some, since Inglot where the cheapest ones I went for them but I got the 18pan pallet for €18 witch I thought is great because I am saving money due to the fact that 5pan pallet costs €10, and 10pan costs €14. Well I was wrong not even looking at the fact that the 18pan pallet is heavy but it is big to carry around especially when most of the time I only needed the 5 eye shadows(at the top) because I use them for eyebrows so it wasn't at all handy to be carrying all huge thing cuz of 5 shadows. After a while I stoped using the Inglot shadows cuz I didn't wasn't to carry the pallet with me as well as even at home it is just big and takes up much space, so for the sake of the 5 shadows I got the 5pan pallet and it was the best decision ever. 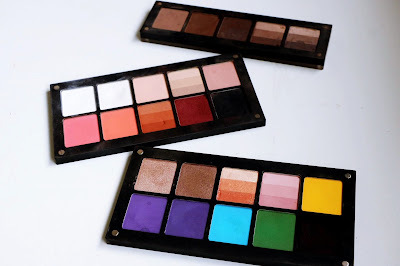 After a while I realized that I will need to get smaller palettes otherwise I wont use the eye shadows and it will end up being total waste of money for them just standing in my drawers, and I was right I did not touch them until I got the smaller palttes and they are so handy now. 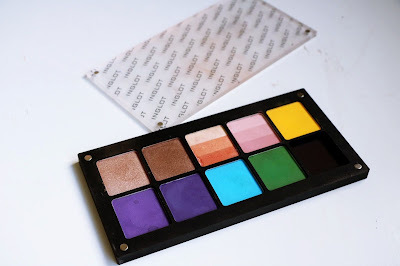 Yes at the start you may spend more money buying the smaller palettes but in the end you will save it because you will actually use the eye shadows if they will be handy to access and carry around. It may not be the case for everyone and some people may love the large pallets but it wasn't handy for me, but everyone makes mistakes and I learned from mine. 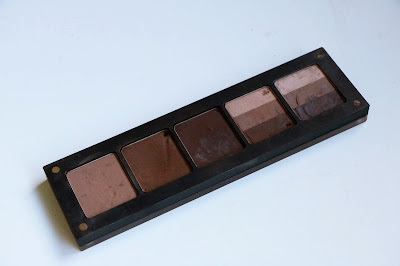 These are my favorite shades to use for brows as you can see this pallet is well used. 375-The light brown I don't use it as often but I have it in case someone is really pale and has light hair. 329, 63,107,117 These are the most used the 117 is great for someone who has ashy color hair and brows. Tip. Wet your brush before using shadows it will make the pigment stronger and eyebrows sharper. From this pallet the 1st color 318 is just white the second one 496 is white with shimmer they are my most used eye shadows if I need stronger brow bone highlight most likely it will be either of those 2colors. First row the last 3shades 330, 113, 341- Good for base color. Second row 331, 314, great transition colors if you want slight pop of color. Last 3 colors 102,450,101- Most used ones. The burned orange one is amazing transition color if you love warm tones. This pallet really is just kinda incomplete half way project, cuz I plan on having 1 separate 10pan pallet with shimmery shadows and 1palette with colorful shadows. 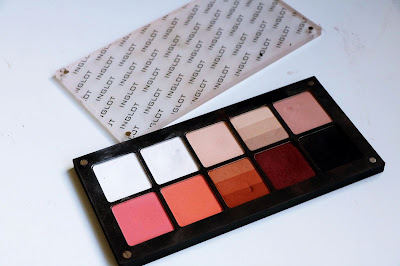 Collection #blushandglow Blush Palette review. Makeup & Beauty supply Haul.